Kamchatka Krai (Russian: Камча́тский край, Kamchatsky kray; [kɐmˈtɕatskʲɪj kraj]) is a federal subject (a krai) of Russia. It is geographically located in the Far East region of the country, and it is administratively part of the Far Eastern Federal District. Kamchatka Krai has a population of 322,079 (2010). 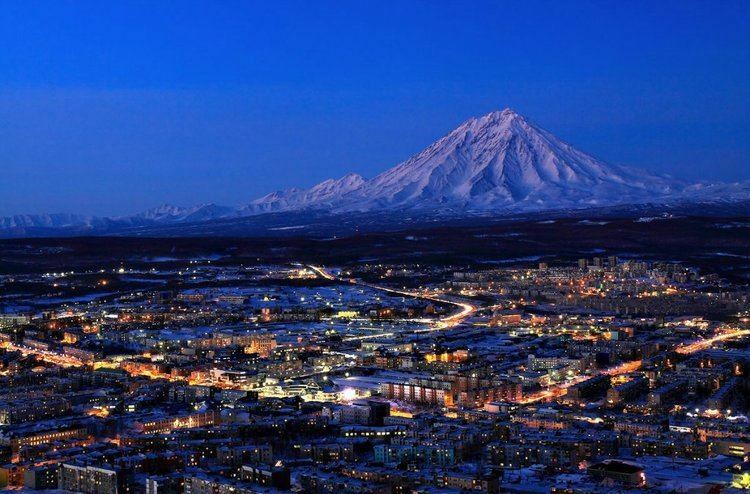 Petropavlovsk-Kamchatsky is the largest city and capital of Kamchatka Krai, and home to over half of the krai's population. 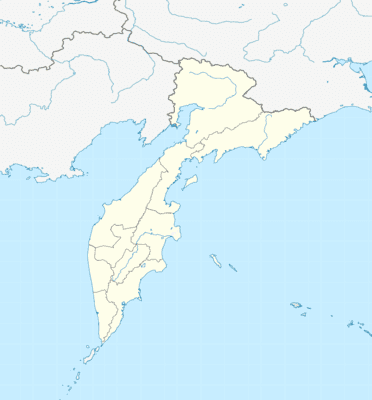 Kamchatka Krai was formed on July 1, 2007, as a result of the merger of Kamchatka Oblast and Koryak Autonomous Okrug, based on the voting in a referendum on the issue on October 23, 2005. The okrug retains the status of a special administrative division of the krai, under the name of Koryak Okrug. The Kamchatka Peninsula forms the majority of the krai's territory, separating the Sea of Okhotsk and the Bering Sea in the Pacific Ocean. The remainder is formed by a minor northern mainland portion, Karaginsky Island and the Commander Islands in the Bering Sea. 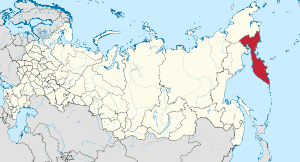 It is bordered by Magadan Oblast to the west and Chukotka to the north. Kamchatka Krai is an active volcanic zone which is home to Kluchevskaya, the largest volcano in Eurasia, and the Decade Volcanoes of Avachinsky and Koryaksky. Kamchatka Krai occupies the territory of the Kamchatka Peninsula, the adjacent part of the mainland, the island Karaginsky and Commander Islands. Washed in the east Bering Sea of Pacific Ocean (length of the coast more than 2,000 kilometers (1,200 mi)), from the west – the Okhotsk Sea (the length of the coast about 2,000 kilometers (1,200 mi)). Mountain ranges: Sredinny Range (the length of about 900 kilometres (560 mi)), East, Vetveysky, Penzhinsky, Pahachinsky, Olyutorskij et al. Heights: Khuvkhoitun (2,613 meters (8,573 ft)), the Ice (2,562 meters (8,406 ft)), Acute (2,552 meters (8,373 ft)), Shishel (2,531 meters (8,304 ft)), Tylele volcano (2,234 meters (7,329 ft)). Kamchatka belongs to the zone of volcanic activity, there are about 300 large and medium-sized volcanoes, 29 of them are active. The largest volcano in Eurasia – Kluchevskaya (altitude 4,750 meters (15,580 ft)). With the volcanic activity associated with the formation of many minerals, as well as a manifestation of hydro geo thermal activity: education fumaroles, geysers, hot springs, etc. The climate is mostly subarctic, more continental in the hinterland and more maritime and prone to monsoons on the coast. Most of the peninsula is covered with forests of stone birch, in the upper parts of the mountain slopes are common alder and cedar elfin. In the central part, especially in the valley of the Kamchatka River, widespread forests of larch and spruce Kuril Ajan. 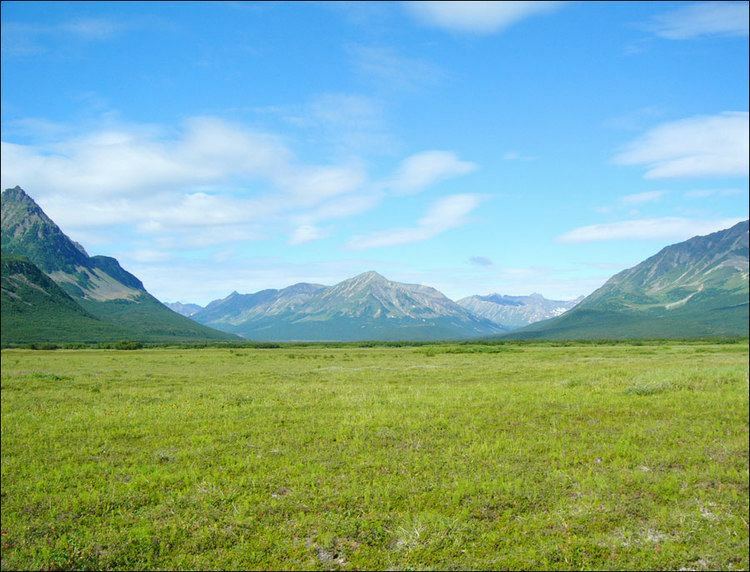 In floodplains, forests grow with fragrant poplar, alder, hairy, Chosenia, willow Sakhalin. In the second tier, and the undergrowth common hawthorn zelenomyakotny, Asian cherry, rowan Kamchatka, shrubs – Kamchatka elderberries, rosehips tupoushkovy, rowan buzinolistnaya, honeysuckle Kamchatka, meadowsweet, willow shrubs, and many other species. Kamchatka, especially coastal areas, characterized by tall – species such as shelamaynik Kamchatka, angelica bearish, sweet parsnip reach a height of 3–4 meters. More than 14.5% of the territory of the Kamchatka Territory refers to the specially protected. There are six protected areas of federal significance (three state reserves, one federal reserve "South Kamchatka", two spa areas – "Resort Paratunka", "Malkinskie mineral waters"); four natural parks of regional significance ("Nalychevo", "Bystrinsky", "South Kamchatka", "Kluchevskoy"); 22 reserve of regional importance; 116 monuments of nature; four protected areas (landscape natural park "Blue Lake", Southwest and Tundra Sobolewski reserves). Kronotsky Nature Reserve is a nature area reserved for the study of natural sciences in the remote Russian Far East, on the coast of the Kamchatka Peninsula. It was created in 1934 and its current boundary contains an area of 10,990 square kilometers (4,240 sq mi). It also has Russia's only geyser basin, plus several mountain ranges with numerous volcanoes, both active and extinct. Due to its often harsh climate and its mix of volcanoes and geysers, it is frequently described as the "Land of Fire and Ice". It is mainly accessible only to scientists, plus approximately 3,000 tourists annually who pay a fee equivalent to US$700 to travel by helicopter for a single day's visit. Kronotsky Nature Reserve has been proclaimed a World Heritage Site by UNESCO. The main industries in Kamchatka include fishing and forestry. Coal and other raw materials are extracted. Due to its geographical location near major shipping routes, it is a center for shipbuilding, ship repair, and related services. There are also oil and mineral resources which are yet to be fully developed. Population: 322,079 (2010 Census); 358,801 (2002 Census); 466,096 (1989 Census). Births: 3,931 (11.32 per 1000, 11.36 for urban areas & 11.20 for rural areas). Deaths: 3,863 (11.13 per 1000, 10.49 for urban areas & 13.63 for rural areas). Natural Growth Rate: +0.02% per year (+0.09% for urban areas & -0.24% for rural areas). After nearly two decades, Kamchatka recorded a net natural population growth instead of decline in 2007. However, in first half of 2008, the trend was reversed and population decline was observed again, partly due to an increased mortality rate among the rural population. 28,084 people were registered from administrative databases, and could not declare an ethnicity. It is estimated that the proportion of ethnicities in this group is the same as that of the declared group. According to a 2012 survey 31.2% of the population of Kamchatka adheres to the Russian Orthodox Church, 4% are unaffiliated generic Christians, 1% is an Orthodox Christian believer without belonging to any church or is a member of other Orthodox churches. 2% of the population adheres to the Slavic native faith or to Siberian shamanism, 1% to Islam, 1% to forms of Protestantism, and 0.4% to Hinduism (Vedism, Krishnaism or Tantrism). In addition, 23% of the population declares to be "spiritual but not religious", 21% is atheist, and 15.4% follows other religions or did not give an answer to the question.